First Line: "Okay, is everyone clear on what they're supposed to do?" Maggie Gerber asked. Sam Collins is the new sheriff in town. That bodes ill since he and Maggie have been at each other's throats since they were in diapers. Maggie decides that she's going to avoid him as much as possible, but it simply is not meant to be. Claire Fremont-- Good Buy Girl, local librarian, and all-round good person-- has been hauled off to jail by none other than Sam Collins himself after a body is found in the library basement. Claire not only knew the victim, she owns the cake knife that was found buried in his chest. Although Maggie realizes Claire isn't being completely honest with her, she knows Claire to be incapable of murder, so Maggie sets out to find the real killer-- whether the high and mighty Sheriff Sam Collins likes it or not! I was a bit hesitant to give this book a try. Having spent most of my working life in the retail field, I've lived through madness like the Cabbage Patch Dolls and Tickle Me Elmo (to name a few), and once you've stood on the other side of the door from a seething crowd showing mob-like tendencies, it tends to color how you look at a group of women who have battle plans when they go out to shop. I shouldn't have worried because the ultimate reason why I read the book-- author Jenn McKinlay writing as Josie Belle-- is the reason why I loved it. McKinlay has such a playful and slightly twisted sense of humor that I can't help but smile and laugh as I read her books. The four women who comprise the Good Buy Girls are fabulous characters who work well together whether it's shopping for Gucci or searching for clues. I even enjoyed the sparks flying between Maggie and Sam. Let's face it. All that fussing and feuding since they were toddlers? What else could it have been leading to? I loved the characters, and the humor. I even appreciated the shopping because the Good Buy Girls have taken the time to get to know the businesses and the business people in their area. It's not just about scoring a deal; it's also about friendship and looking out for each other. The only thing that marred this book for me was the blazing red neon sign hanging above the killer's head, and although that was a bit of a disappointment, I don't really care. McKinlay/Belle has created such a great cast of characters that I'm really looking forward to reading what they get into next. The things you learn ... 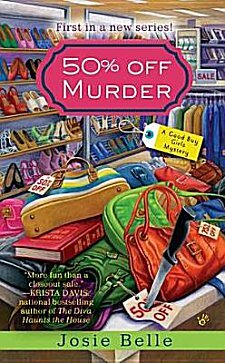 I had no idea that Josie is actually Jenn (and I really enjoyed the first book in the Library Lovers' Mystery) and wouldn't you know it - "50% Off Murder" is also on my TBR stacks and shall be devoured soonish!! I'll be picking up the third LIbrary Lovers mystery this Saturday when Jenn appears at the Poisoned Pen. I'm excited! I agree, when you have lived through Christmas is the retail world, it tends to color the whole shopping experience!! This book sounds like fun, I'm adding it to my TBR. Cathy - This really does sound like a fun book. And I'm always happy to try a book that has some solid wit in it. I've done The Retail Shuffle myself, so I'm sure I'd be able to 'get' the characters too. Thanks for the suggestion. This sounds like a cute book! My sister would probably love to be a Good Buy Girl! Then she definitely needs to read about the Good Buy Girls, Kathy! I loved reading this one..I think there is a new one being released in this series very soon, this month I think, or it might be next month. Might want to check it out. Great review. I think it's being released at the end of this month, Kimberlee (A Deal to Die For). I'll certainly be getting a copy to read! I always enjoy a Jenn McKinlay books--have to put this series on my list! I've never read Jenn McKinlay, but this sounds just delightful. I added it to my list. I'm seeing a lot of cozies come up around the blogosphere and they're all sounding fun.